I love me some fruit salad. It’s rich in flavor. And good for you. There’s no need to add artificial sugars, as the fruit is sweet enough. But there are still some fun ways to dress up a simple fruit salad. I love adding different toppings and spices to fruit salad. Plus, how about this easy, “no juice” storage idea! 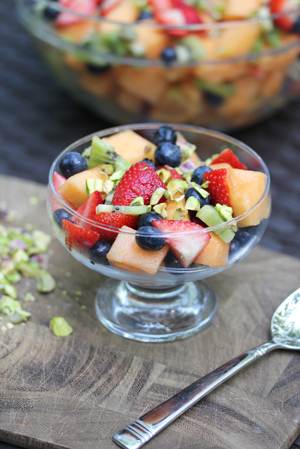 Crushed Pistachios – Make fruit salad. Add crushed pistachios just before serving. Simple as that. Love the crunch and flavor they bring to the fruit! Grapefruit Juice and Cinnamon – If you have a fruit salad with apples and bananas tossed in, you’re going to need an acidic juice to keep them from browning. Try grapefruit juice with a few sprinkles of cinnamon. A delightful way to dress up a fruit salad…learned from a dear family friend! Slivered Almonds – Like pistachios, slivered almonds add great texture and flavor to the fruit salad. A wonderful complement of flavors too. Sweet Lime Vinaigrette – Toss your fruit salad in a light sweet lime vinaigrette for a potluck, baby shower or other fun ladies event this summer. Stored in Salad Spinner Basket and Bowl – Fruit Salad that sits in the fridge for 2-3 days can get quite juicy. If you store your fruit salad in the salad spinner basket, the juices will drain into the salad spinner bowl and the fruit that you eat/serve will be juice free. If you don’t want to waste the liquid, add it to your lunchtime or snack time smoothie that day! Got a favorite fruit salad recipe or “dress up” to share!? I had that exact fruit salad with dinner two nights ago. We interchange fruit with salads as the weather warms up. It goes great with barbecue! This looks delicious. We’ll be trying this, for sure. I never thought about dding nuts. I imagine that enhances the flavor greatly! My absolute favorite fruit salad is dressed with just lemon juice and honey…..it’s so delicious!